Squirrels - Nature's Little Speed Bumps. Roadkill shirts aren't everyone's thing. But they are some people's thing. And this is one of them! Available in men's sizes here. Squirrels in the attic? Then maybe you actually do like to think of squirrels as nature's little speed bumps. Or, it could be that you just can't stand your friend's/significant other's/family member's pet squirrel, or the neighborhood squirrels that eat all of your bird seed. Or, maybe this shirt relates to a recent experience you or a family member has had on the road. Heck...we all make mistakes. And some of us make them on purpose. No matter which of the above cases applies (if any), this remains a funny shirt. 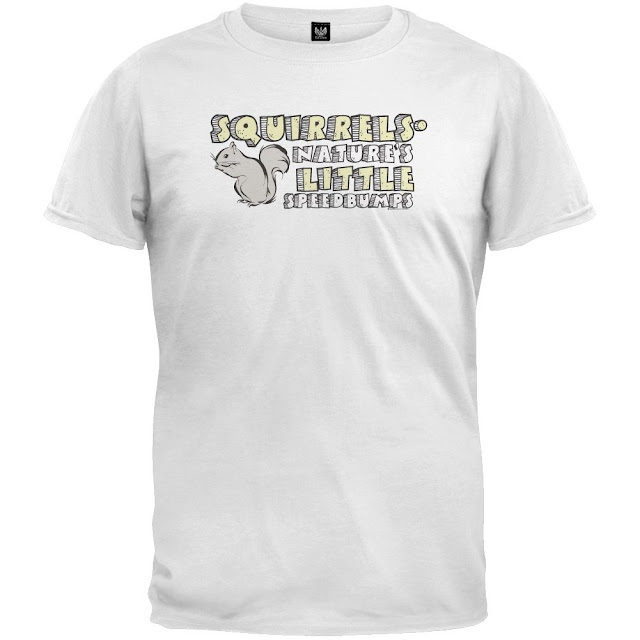 A funny squirrel shirt, in fact. And that's what we specialize in here. The hand-drawn block letters add a nice touch to what would otherwise be a text-heavy design. The small squirrel icon in the lower left of the design adds a little visual variation to the shirt front.